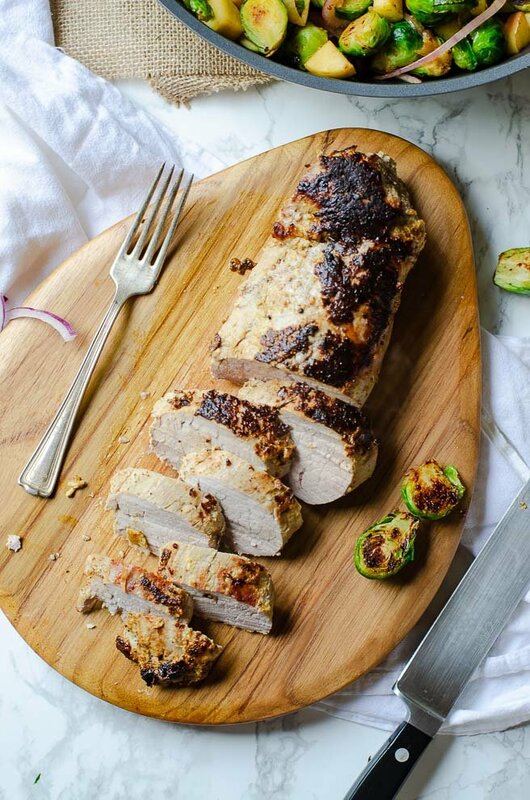 Home » Roasted Pork Tenderloin with Apples & Brussels Sprouts – One Pan! Roasted Pork Tenderloin with Apples & Brussels Sprouts – One Pan! This post is sponsored by BabbleBoxx.com on behalf of Anolon. All opinions are mine alone and partnerships like this help keep the blog ad free for your enjoyment. 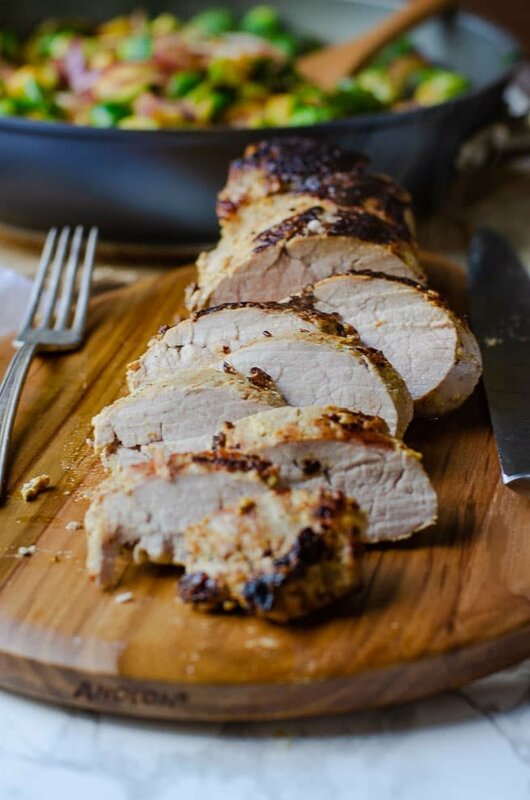 I hope you love the product and the easy roasted pork tenderloin recipe as much as I do. What flavors make you think of Autumn? For me it’s deep, earthy flavors balanced with a slight sweetness or acid to brighten them up. That’s this easy roasted pork tenderloin recipe to a T.
After being rubbed with a thick coating of dijon mustard, the pork tenderloin is roasted in the oven. While it rests, the same pan is used to cook the Brussels Sprouts and apples on the cooktop. Complemented with a light but flavorful white wine and mustard sauce, this tender and juicy roasted pork tenderloin is a dream. Plus, did I mention this recipe is finished in one hour or less? AND the cleanup in this nonstick pan is ridiculously easy. Say hello to your new favorite quick and easy dinner! The trickiest part of knowing how to cook pork tenderloin correctly is cooking it all the way through. If you cook the pork purely on the stovetop, the outside may be overcooked before the middle is done. If you cook it in the oven incorrectly, it comes out unattractive and dry. Before cooking, use a sharp knife to remove any unnecessary patches of silver skin. (It’s the thin, shiny, bluish stuff that looks like neither skin or fat.) Often, it is removed before packaging, but double check your pork tenderloin just in case. Next you season it well with salt and black pepper. Since this roasted pork tenderloin gets rubbed with mustard, it’s easy to forget the seasoning. I recommend rubbing it into the meat before adding the mustard. It tends to stick better that way. Pork tenderloin is a lean cut of meat, so you need to be careful of overcooking it. Since the meat doesn’t provide a lot of fat for cooking, use oil to help create a golden brown crust. You may need to add extra to the pan when you flip it. However, the nonstick coating on this skillet will help keep that to a minimum. Aim to have the internal temperature of the roasted pork tenderloin between 140-145 degrees in the thickest part of the meat. It gets covered with foil while it rests, which will help bring it up to a safe temperature. This also keeps it tender and juicy instead of overcooked or dry. How To Pan-Fry. This pork tenderloin recipe starts by pan-frying. Find out how to get that beautiful golden brown crust by brushing up on this cooking method. How To Buy & Store Apples. Make sure that your apples bring the right flavor profile to this dish by choosing ones that are ripe. Find out what to look for at the market and how to keep them fresh at home. Homemade Chicken Stock. For the sauce, this roasted pork tenderloin recipe uses some chicken stock. If you want better control over flavor and quality, try making your own with this in-depth series. What’s the Best Pan For Making Roasted Pork Tenderloin? This skillet is also oven safe and cooks on any cooktop. (Which is ideal for this roasted pork tenderloin recipe, which utilizes both.) It is made of hard-anodized aluminum and patented Precision Forge™ technology. Which is a fancy way to say it has fantastic durability and longevity. What Temperature Do I Roast Pork Tenderloin At? If you want a beautiful crust, you need to roast your pork tenderloin at a high temperature. I recommend 450°F. This allows it to cook quickly and with only one flip. 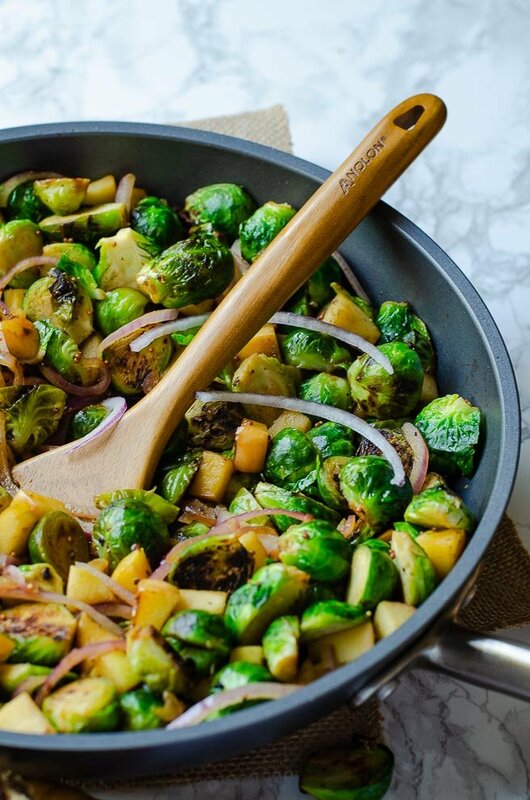 While it cools, you can finish your Brussels sprouts and apple mixture in the pan on the stovetop. Since this roasted pork tenderloin cooks at such a high temperature, it’s important that the pan is oven safe. (Like this one.) In fact, many nonstick pans aren’t oven safe. Even the ones that are usually have a low temperature threshold. This deep covered skillet however, is oven safe up to 500°F. So, there’s yet another reason to love it more! Can Pork Tenderloin Be Pink In The Middle? As long as the internal temperature is 145 degrees, yes, the roasted pork tenderloin can be pink in the middle. To test your temperature, use a well calibrated meat thermometer in the thickest part of the roasted pork tenderloin. This usually gives you a barely there light pink line. The kind that makes you wonder whether you’re actually seeing pink or if it’s a trick of the light. Take note though, the thickest part of the meat may not be the middle. For mine, it was about one-third in from the left. The shape of every pork tenderloin is different, so cooking times to get to a safe internal temperature may vary. Your roasted pork tenderloin leftovers will stay fresh in the refrigerator for up to five days. Make sure to let everything cool completely before storage to keep the Brussels sprouts from over-steaming in the container. Bake for 25 to 30 minutes, or until reheated throughout. Since this recipe cooks at such a high temperature, I recommend using a neutral cooking oil with a high smoke point. My favorite is refined avocado oil, but canola or vegetable will work as well. The smoke point of olive oil is only around 400°F depending on the quality. Working with a different oil will prevent scorching the oil or starting a fire. Note: Once this pan is transferred to the stovetop, please make sure to turn the handle away from your body. This will help reduce the desire to accidentally touch the very hot handle. Get your free printable grocery list for this Roasted Pork Tenderloin recipe HERE. This easy one pan dinner is full of delicious autumn flavor. The pork tenderloin is rubbed with mustard before roasting and the meal has a fragrant but light white wine mustard sauce. Place your 12" deep skillet into the oven and preheat it to 450°F. Once it is to temperature, let the pan continue to preheat for 10 minutes. While the pan preheats, pat dry the pork tenderloin with paper towels then rub it with salt and pepper. Pour one tablespoon of the mustard onto each side of the pork tenderloin and use the back of a spoon to spread it around until it is completely covered. Carefully remove the skillet from the oven and add in neutral cooking oil. Swirl it around and then use tongs to carefully transfer the pork tenderloin. Return the pan to the oven and cook for 10 minutes. Carefully remove the pan from the oven and reduce the heat to 400°F. Flip the pork tenderloin and return the pan to the oven to cook for another 12 minutes, or until the internal temperature reaches 140-145°F. Transfer the pork to a cutting board or plate and cover it with foil. Move the pan to the stovetop and turn the heat to medium high. Add a teaspoon of neutral cooking oil to the pan and pour in the Brussels sprouts. Cover it with the lid and let them cook for 5 minutes, only stirring once or twice. Add in the diced apples and sliced onions and cook for another 5 minutes. Do not put the lid back on. Stir together the white wine, chicken stock and whole grain mustard. Turn the heat off and pour over the vegetables and apples. Stir. Carefully carve the roasted pork tenderloin into slices, serve with the Brussels sprouts and apples and drizzle with leftover sauce from the pan. For an extra flavor boost, pour any juices that released onto the cutting board or plate back into the pan before serving. If your Brussels sprouts are large, you can maintain the same cooking time by quartering them instead of halves. This sounds like a great easy weeknight meal!!! I love pork and apples together and the addition of the brussel sprouts sounds incredible! Thanks for the recipe! Pork loin is one of my favorites but I’ve never done it like this! It sounds great – and mustard would give it such a good tang! It certainly does Lisa. I think that every time I make it I keep adding more mustard to it because I love it so much! lol. You had me at “one pan” but then you added pork, and brussels sprouts and I’m SOLD!!! There is something about one pan + one hour or less that makes for cooking perfection! Apple, pork and mustard are a match made in heaven. Simply yummy! This looks fantastic. All you had to say was pork and I’m drooling. A delicious one pan meal for the win. The flavors in this sound amazing. I love how simple it is to make. Yes! I am all about the simplicity! Plus, it really honors the flavors of each ingredient and does get too bogged down. I’ve never heard of that pan! It looks sturdy and perfect! 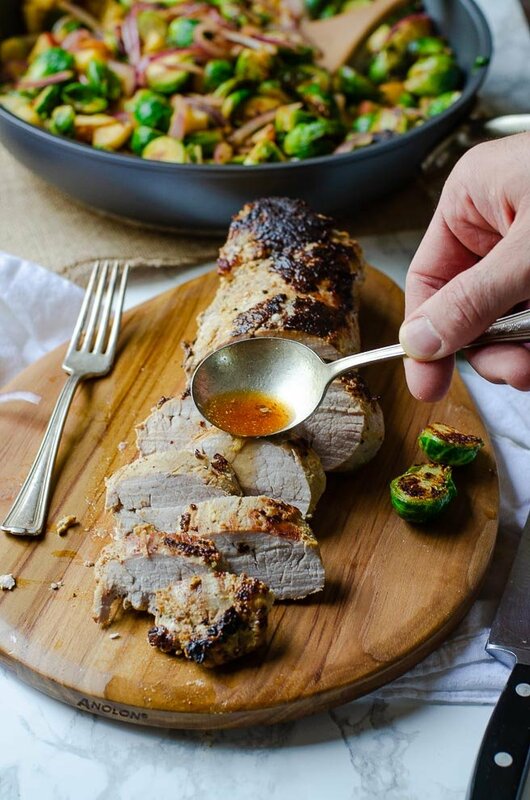 I love that you can use that pan to make that beautiful pork tenderloin! It looks so delicious and easy!! 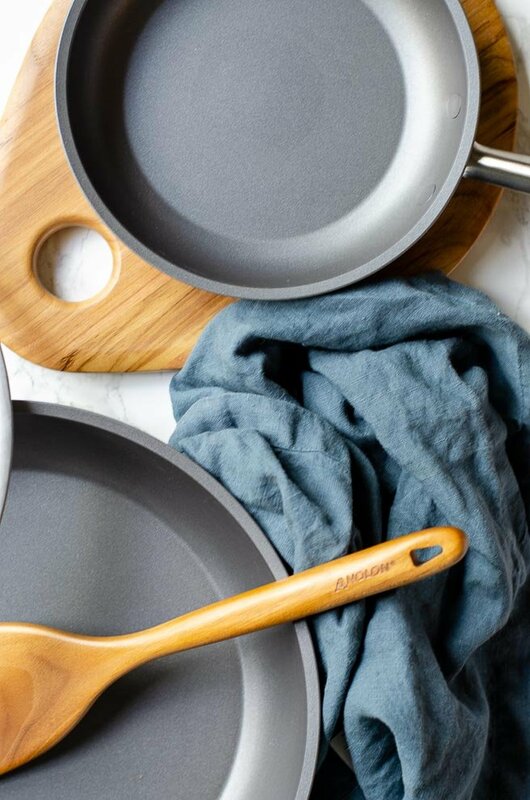 Sturdy and perfect is a great description of the Anolon Accolade deep skillet! It has so many amazing features and I LOVE how easy it is to clean! I absolutely love pairing pork with apples… they taste so wonderful together! One pan meals are ideal and make for easy clean-up… I love it! I love making pork tenderloin this way. So simple and easy to make. Mustard definitely would be perfect flavor. Love the tips and notes you added. Thank you, Veena. I used to sear the pork tenderloin on the cooktop first, then finish it in the oven, but this way turns out such a tender and juicy pork tenderloin that I could never go back! Lovely pork dinner for the whole family! Great combination of flavors and spices. I love how the apples really brighten up the dish. Even though it’s all very autumnal, it does’t feel heavy like most meals this time of year. My favorites all in one meal. And it looks like that pan cooks everything beautifully! The deep skillet does such a good job of cooking the pork tenderloin. Plus, it was a DREAM to clean up. My husband has even requested that I cook everything in that pan because it’s so easy to clean. I love one pan meals! I’ll have to check out that pan. Thanks for sharing! One pan meals are the best! Even more so when they are one pan recipes that are done in under an hour! I always feel like I hit the jackpot with those! I love that pan, hmmm…. maybe an early Christmas present. Your recipe is speaking to me as my hubby loves pork tenderloin and I love brussels sprouts. To see them together in a recipe is perfect. Thanks for this! I am loving the flavour combos in this dish! And that pork loin looks so juicy and tender. My husband will love this! They’re so classically autumnal, aren’t they? Plus, you can never go wrong with mustard and white wine! I used to get SO PARANOID about pork being pink in the middle before I realized I just need to trust my thermometer. The sauce for this recipe sounds so freaking good! I love one pan dishes! My husband has been trying to take on more of the cooking and I bet he would not only love this but would think it was totally feasible for him to make. I’ll definitely be sharing it with him. I love that this recipe is very approachable. Even when you go to look at then ingredient list you think “wow, that’s not as involved as I thought” based on all of the flavor in the meal. I hope that this recipe helps encourage a further love of cooking. What a gorgeous looking meal, perfect fall flavours combo, will try it soon! I love how it has all of the delicious autumn flavors but it doesn’t get overly heavy. It’s a great meal for balancing out the rich dinners and desserts of the season!